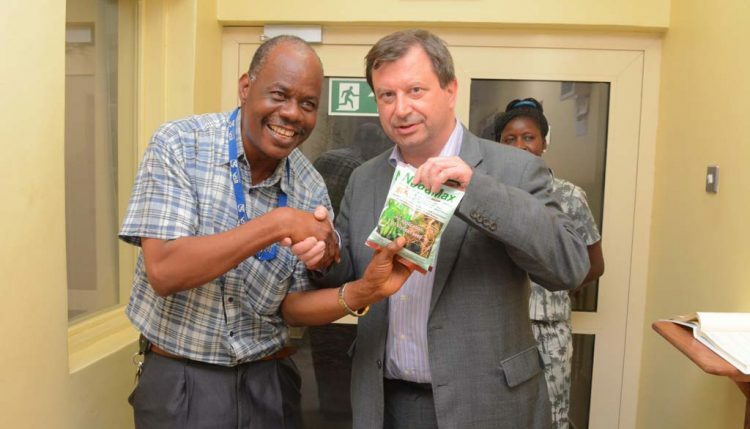 His Excellency Paul Arkwright, the British High Commissioner to Nigeria, visited IITA, Ibadan, on 2 November, to familiarize himself with the institute and establish grounds for collaboration. IITA Deputy Director General, Partnerships for Delivery, Kenton Dashiell, accompanied by some senior management staff, received the High Commissioner and his Communication Manager and Political Adviser, Adewale Adebajo. DDG Dashiell gave a breakdown of IITA’s achievements and success stories to date, and emphasized IITA’s commitment to improving agriculture in Africa, focusing on the need for collaboration. His Excellency receives a NoduMax souvenir from Plant Manager, Ayodele Alonge. “IITA has been working with partners for the past 50 years to generate agricultural innovations to meet Africa’s most pressing challenges of hunger, malnutrition, and poverty. This cannot be easily achieved without your support and commitment; we need you to step in and contribute to help us secure the path to food security,” he said. Evelyn Ohanwusi, Interim Head, IITA Youth Agripreneurs (IYA), gave an overview of their journey, highlighting enterprises achieved and areas of intervention. “We are young, vibrant, and skilled youth who are looking for opportunities to scale up while engaging more youth in agribusiness. If the right technology can be put in place, I believe we will go a long way in solving the problems of malnutrition and unemployment in Nigeria,” she added. The Commissioner expressed his interest in IITA’s activities, most especially the youth program. “I am honored to be in the midst of determined youth and management. This is my first visit and I need you to win more souls to the agribusiness world. If only Nigeria can have more focused youth like this, then it is certain we can feed ourselves through agriculture, which is one of the solutions to Nigeria’s problems,” Arkwright stated.